The fictitious 21st child of J. S. Bach is a creation of "Professor" Peter Schickele of the equally-fictitious University of Southern North Dakota at Hoople. 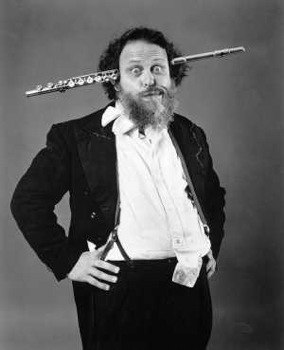 Schickele presents live concerts of the works he has "discovered," which parody the norms of baroque and classical music and feature fanciful instruments such as the tromboon, the left-handed sewer flute, the windbreaker, and the double-reed slide music stand ... and puns galore. Recordings have been available since 1965. Especially if you knew the music and had a good ear (even better were a musician yourself) his performances were an absolute aural delight. 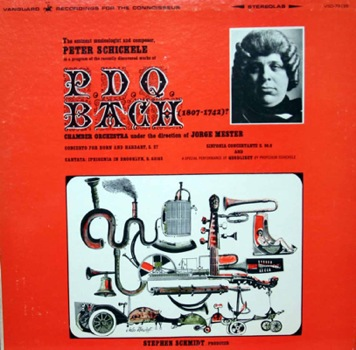 I first encountered P. D. Q. Bach in 1966 or so, when I was 16. Having been raised on classical music, I found the live concert I attended, and the album pictured here, hilarious. Last night, my 17-year-old daughter and I cracked each other up singing arias from "Iphigenia in Brooklyn," which is on that album.